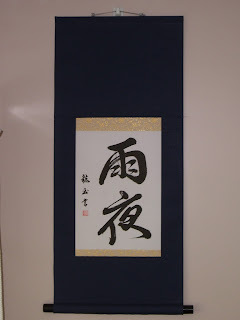 The scroll is written in the semi-cursive style called Gyousho. It is bordered by a gold on gold ichimonji in the Maru Hyougu style. 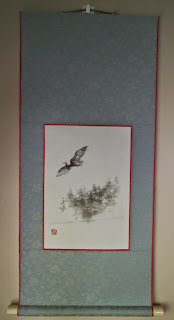 It is completed with a black, plastic jikusaki and a Takuboku (white with blue fleck) hanging string. 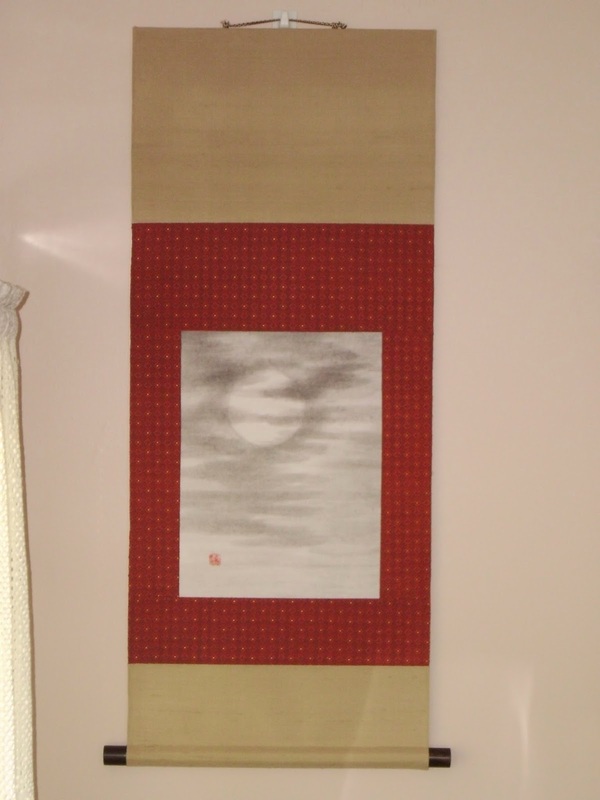 This was an additional cloudy Moon scroll that has been sold to a bonsai artist. It is painted by Mariusz Szmerdt. I made this in a more traditional Yamato Hyougu style, to go with an informal styled tree such as a bunjin style pine or conifer. The cloths on the top and bottom are a benberugu silk, in the shike style. The chuumawashi is a Shoken (pure silk) and the ichimonji and fuutai are made of a Shinkinran. This is another painting by Mariusz Szmerdt. This was originally designed as a bonsai kakejiku, but could be used in many situations. It is in a different scroll style than I normally frame in. Can anyone name it? There was symbolism also in the colors I used based upon the subject matter of the painting. Can anyone guess the meaning? This painting was purchased in an auction. It has a bird viewing the Nandia berries. I purchased this for use as a bonsai scroll. The size and dimensions are very nice. It is painted on silk, which is very beautiful. I do not know the age, but when it arrived, the scroll was in tatters and it had to be redone. Here are the dimensions of the scroll. This is another painting by Mariusz Szmerdt of Poland. He was working on a cloudy moon for another customer, and this was an iteration to make sure it worked properly. The full moon is often times an Autumn symbol in Japanese culture. Rather than design this neutrally with the cloths, I decided to make this specific for the season. I styled it in a Nidan Hyougu style, which is a little more formal than the Maru Hyougu style, but a little less formal than the Sandan or Yamato Hyougu style. I think this scroll would work best for a Juniper in a Moyou style. I would not pair a deciduous tree for a fall display, because the cloth already has reds and yellows in it. The red/yellow chuumawashi cloth is a pure silk (Shoken). The Ten/Chi light brown cloth is also a (shike) silk. 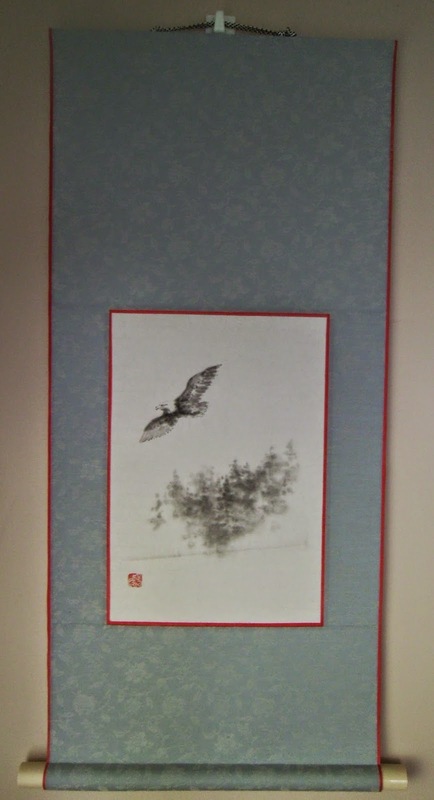 The scroll is finished with ebony jikusaki that are 8 bun in diameter, and the hanging string is the Kodai San Iro.